Welcome to the Best Kids Martial Arts Program in Maryland! An estimated three million children miss school every month because they fear bullies. The zero tolerance policy which strictly prohibits students from defending themselves in the Maryland school systems, has created a very tough situation for both parents and children. Victims not only fear getting beat up and/or harassed by bullies, but also fear getting in trouble for defending themselves. We teach our young students to first try and verbally handle the situation without using any physical force, we actually give them very specific phrases and responses to common bullying behaviors. We then advise them to tell an adult about the situation. Only when all options have been exhausted do we advise them to use their skills. We believe that patience and tolerance are huge parts of being a good marital artisit, however, sometimes the fight picks you and there is no other choice but self-defense. No other Kids Martial Arts classes in Columbia, Maryland discuss these vital topics. This is what sets Gracie Jiu Jitsu Maryland apart from all of the other Martial Arts schools in Maryland. Enrolling your child in our classes could mean the difference between them being bullied in school or being 100% confident when they walk the hallways. When kids are confident the bullies leave them alone. Our kids martial arts programs in Columbia, Maryland and Finksburg, Maryland focus entirely on self-defense and using non-violent takedowns and control positions. This makes jiu jitsu an effective and safe self-defense system for children. Almost every other martial art relies on overpowering the opponent with violent kicks and punches. This often backfires for the student especially if he or she is smaller or younger. What if a student cannot overpower the attacker? What if a student does happen to punch or kick the bully and injures another child badly? This risk involved with these methods is just not worth it. 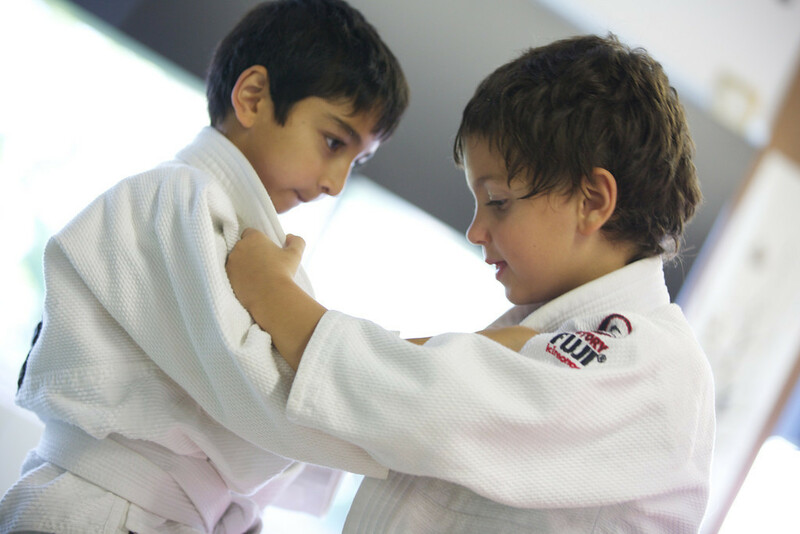 Gracie Jiu-Jitsu Maryland offers a tested and proven method that will help your child gain the confidence that they need to be successful. Instead of fighting fire with fire, our students learn that they should fight fire with water! The strategy in Brazilian Jiu Jitsu is to close the distance, take the bully to the ground and to control the bully until an adult arrives to help. By introducing youth martial arts students to real-life scenarios in a controlled and structured environment the students learn true confidence and realistic self-defense techniques. Students also learn the true meaning of work-ethic, respect, self-discipline, focus and confidence. A confident child is a Bully-Proof Child! The reality is that the average kids Martial Arts programs in Maryland engage in outdated and dangerous training methods. Things such as karate board breaking, karate forms, and outdated weapons are not only unsafe but also highly ineffective in preparing students for realistic street self-defense in an actual altercation. In these more commercialized martial arts schools it is far easier to achieve belt ranks. Kids get promoted to karate black belts too quickly and are given a dangerous false sense of security. At Gracie Jiu Jitsu Maryland we provide a very specific attendance tracking system, a safe and structured class format and an easy to follow curriculum. The students are expected to demonstrate respect, focus and discipline at all times. Our standards are very high for our staff of professional instructors, we only hire the most patient and enthusiastic instructors to teach the children. At Gracie Jiu-Jitsu Maryland we take great pride in providing the most organized and controlled kids Martial Arts classes in the area. If you have ever observed classes at another Martial Arts school you have most likely seen disruptive students wasting class time, lack of overall control and teenage instructors running the classes. For a parent that is serious about your child learning self defense Gracie Jiu-Jitsu Maryland is the best option. If you are interested in instilling your child with unshakable confidence while reinforcing positive values and good character, the youth Gracie Jiu Jitsu program is for you!!! We are committed to running the best kids martial arts classes in Maryland.